Fluoride protects teeth from tooth decay and helps heal early decay. Ask your dentist or doctor if your water has fluoride in it. Healthy teeth should be all one color. If you see spots or stains on the teeth, take your baby to your dentist. Clean your baby’s teeth as soon as they come in with a clean, soft cloth or a baby’s toothbrush. Clean the teeth at least twice a day, when your child wakes in the morning and right before bedtime are best. When your child’s first tooth appears you should start brushing with a tiny smear of fluoride toothpaste, at about age 4 use a pea size drop of fluoride toothpaste. Until they are 7 or 8 years old, you will need to help your child brush their teeth. Milk, formula, juices and other sweet drinks all have sugar in them. Sucking on a bottle/sippy cup filled with such liquids can cause tooth decay. Do not put your baby to bed with a bottle/sippy cup filled with anything other than water at night or at nap time. If your baby uses a pacifier, do not dip it in anything sweet like sugar or honey. Encourage your child to drink from a cup near their first birthday. Regular visits to the dentist should begin by their first birthday. 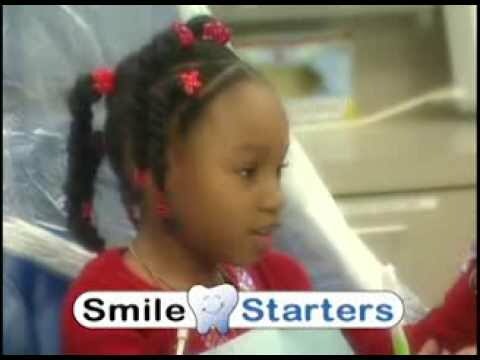 At this first visit, your dentist can quickly check your child’s teeth.